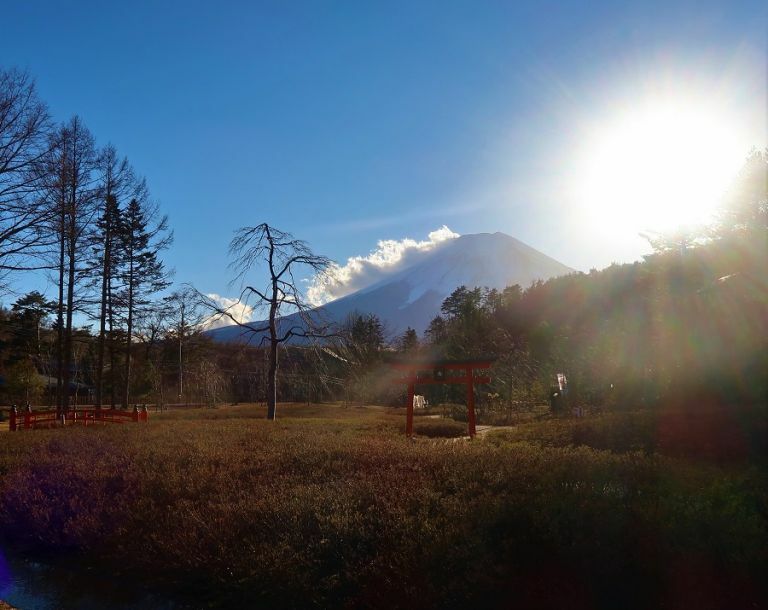 For Japanese people, Mt Fuji is so much more than a mountain, or a volcano for that matter. The perfectly symmetrical cone-shape has inspired countless poets, musicians, and artists. Katsushika Hokusai, for example, famously painted 36 views of Mt Fuji alone. In ancient times, the volcano served as training grounds for samurai and Buddhist monks. Today, it’s still considered a sacred place by Shintoists and Buddhists alike. Thanks to its religious and cultural significance, Mt Fuji became a certified UNESCO World Heritage Site in 2013. Mt Fuji is an active volcano, but teams of geologists carefully track the seismic activity and declare it safe for visitors. Thousands flock here every year to take in the scenery, climb the summit, and enjoy the nearby attractions. If you’re planning on heading to Mt Fuji, read on to find out how you can enjoy this powerful peak. The immediate area around Mt Fuji is rather rural, and the closest major city is Tokyo (95 km/60mi away). Small cities like Gotemba, Fujiyoshida, Fujinomiya, and Fuji City surround the foot, and it’s easy (though a bit time consuming) to get around them by public transportation. 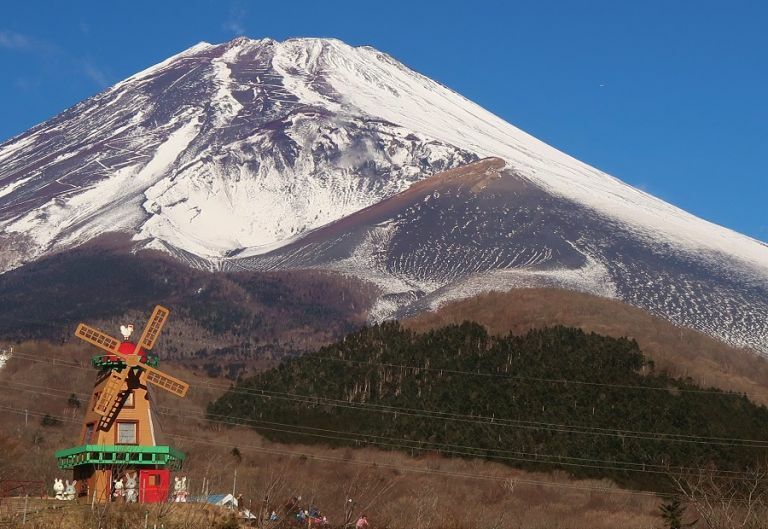 Don’t miss out on these places when you take a day trip from Tokyo to Mt Fuji! If you’re traveling with children, take them to Grinpa Amusement Park where family-fun, athleticism, and brain teasers come together! Attractions include the Sylvanian Family Village and the Kodoko 3D Maze. You can also sled or skate from December to March. In the warm seasons, you can enjoy the tulip festival from mid-April to May and 300,000 dahlias from July to October. 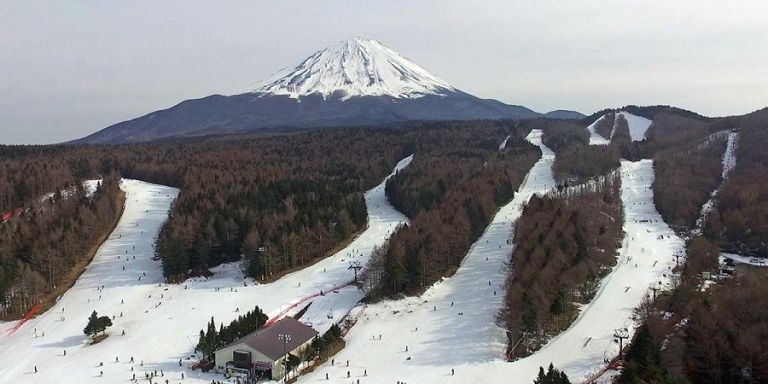 In the foothills of Mt Fuji lies Japan’s first ski resort: Yeti Snow Town. 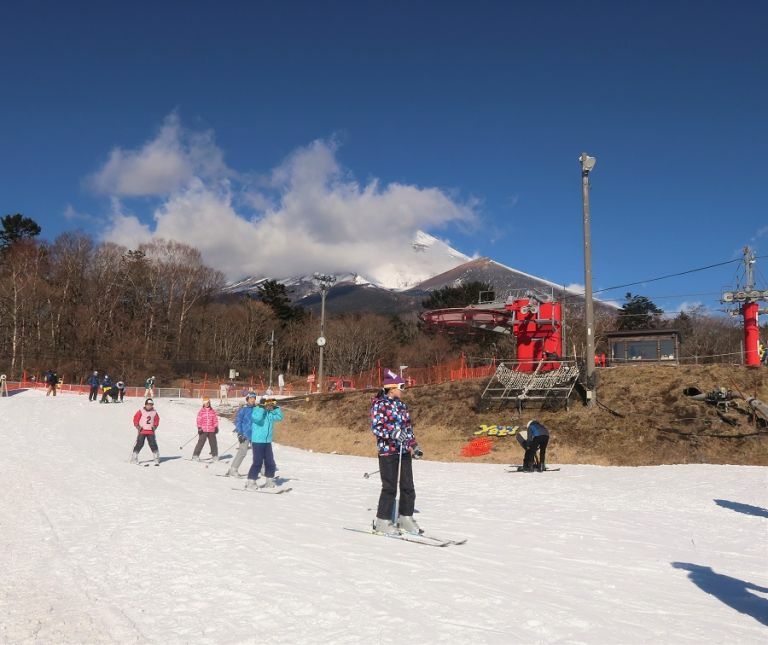 With Mt Fuji at your back, you can enjoy slopes from beginner to advanced levels from late October through early April. You can rent everything you need onsite, and skiing classes are offered in multiple languages including English. Additional attractions include facilities for young children like the snow park and nighttime light displays. Like Yeti Snow Town, Fujiten Snow Resort offers multiple slopes for beginner and advanced skiers and snowboarders, as well as facilities for children. As you ride the lift, Fuji will peak out her head at you for a grand view. Interestingly, you can enjoy skiing here year-round! In the warmer months, when the snow won’t hold, the staff lays out special mats you can use skis and snowboards on to keep your skills up! If you don’t have time to see Tokyo Disney, head here to get in all of your theme park needs! This place is heaven for roller coaster enthusiasts. 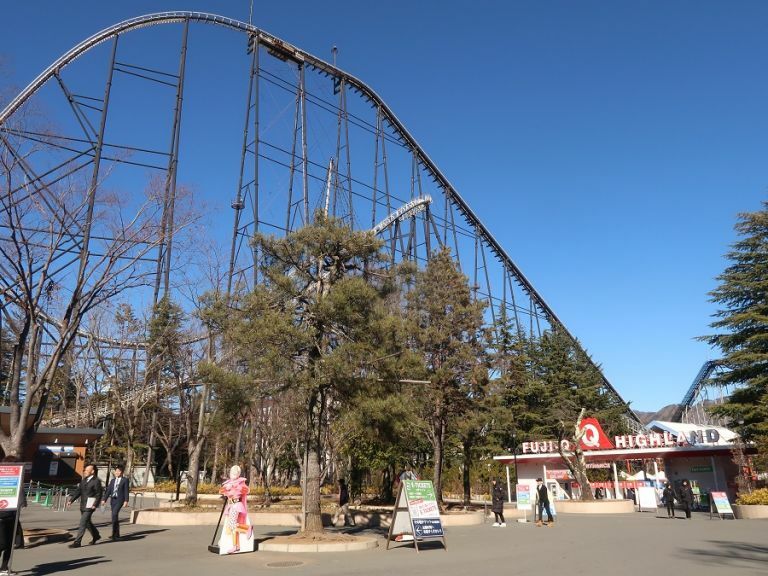 Fuji Q holds earth-shattering records for some of the tallest, fastest, and steepest rides in the world. As you scream in delight, you’ll be met by sudden views of Mt Fuji—sometimes from upside-down! The deadly ninja assassins of Japan’s past have fascinated the world for centuries. At Shinobi no Sato Ninja Village, you’ll have a chance to learn all about the ninja’s secrets, and see them in action too! The main event features a ninja show where you’ll watch them battle on stage. You can also enjoy a walk through a traditional Japanese garden, or dip your toes in a soothing foot onsen while looking at Mt Fuji. Who says you can’t enjoy nature, art, and traditional Japanese culture all in one day? The museum features the work of artist Kubota Itchiku who revived the Tsujigahana silk dyeing technique. Inside, you can see his unfinished masterpiece “Symphony of Light,” which upon completion will be made of 80 kimonos showing Mt Fuji through the seasons. You can always take a cruise on Lake Ashi, but for a dash more of fun try a Kaba Bus! Kaba is the Japanese word for “Hippo,” and these buses are made for the land and the water! As the bus drives on the roads, your guide will teach you all about the wildlife near Lake Kawaguchiko. When you get to the shore—bam!—the bus becomes a boat, and you’ll get wonderful pictures from anywhere you sit. 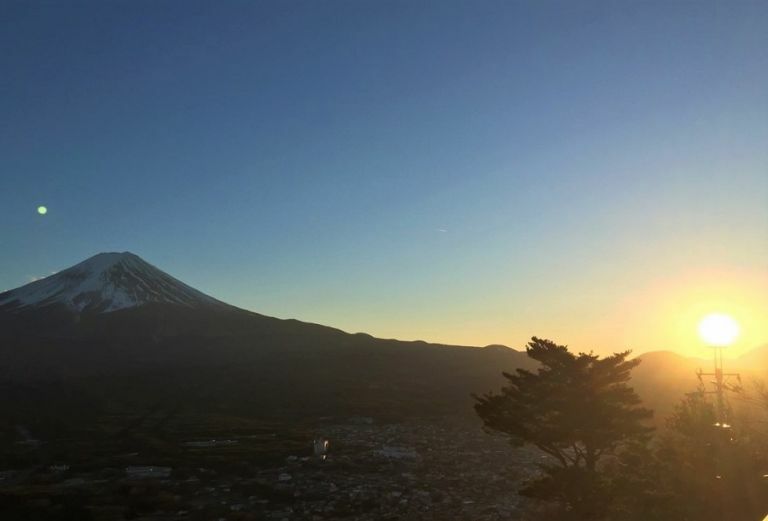 To see Mt Fuji from its base to its peak, climb aboard the Kachi Kachi Ropeway on Mt Tenjo. As you ride the three-minute ascent, you’ll see an expansive view of Lake Kawaguchiko and the city below. At the top, you’ll finally see Fuji! While you’re here, try the green tea or steamed wild boar buns at the refreshment shop. 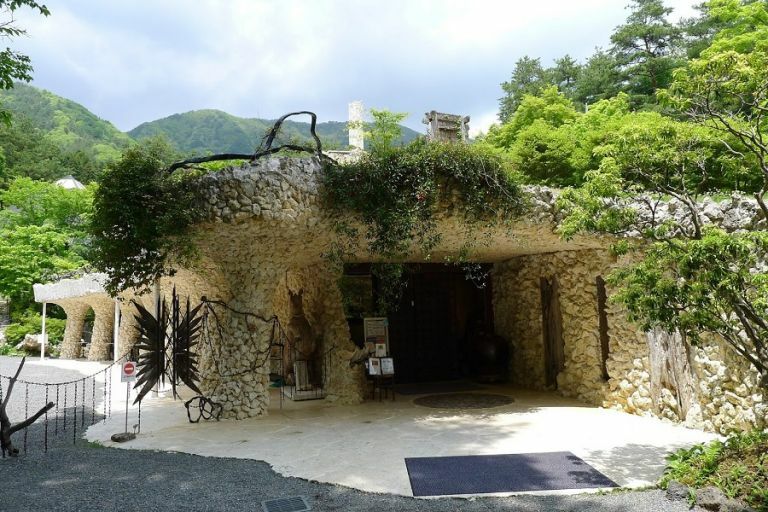 After you get your fill, you can hike around Mt Tenjo, or take the ropeway back down. If you’re stopping at Kawaguchiko station during your travels, take a moment to explore the streets near the station. Everywhere you look, the peak of Mt Fuji is in plain sight. 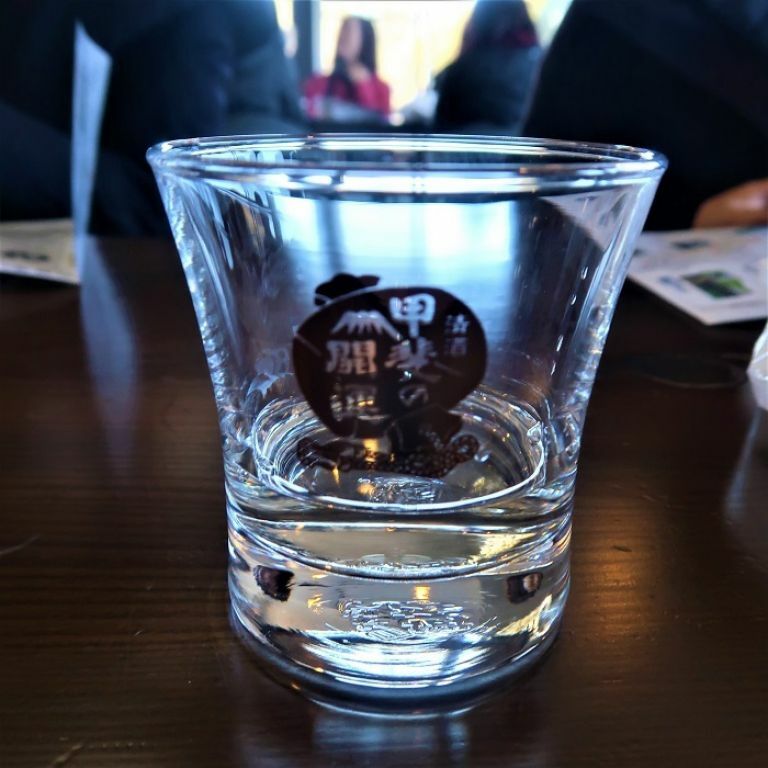 A 10-minute walk from the station takes you to the Ide Brewery, which is known for making Nihonshu (sake) and Umeshu (plum wine) from the waters of Mt Fuji’s lakes! From late October to mid-February, a strange phenomenon takes over the mountainside. In the twilight hours of these months, the sun sets over Fuji’s peak lighting it up like a gem. The name of this event? Diamond Fuji! Although you’ll get the best views the closer you go, on clear days, you might be able to see it from Tokyo Tower! If it’s always been a dream of yours to see the top of Japan’s highest mountain, plan for a trip between early July and mid-September. This is the only time that climbing trails open for hiking on Mt Fuji! Most people start at Mt Fuji’s 5th station before setting out on foot. Some make it a two-day trip and stay overnight in the cottages at higher altitudes. Others climb the 3,776 meters (12,380 feet) in one go! The goal is to watch the sunrise from the top and scream “Bonsai!” to welcome the new day. Everyone loves seeing cherry blossoms in the spring, but there’s one more pink flower you must see this time of year—shibazakura! From mid-April to May, 800,000 moss phlox bloom in the fields near Fuji’s Five Lakes. With them comes a festival to celebrate the new season, as well as food booths and the pop-up café, Fujiyama. Japan’s autumn leaves attract visitors from all over the world in the fall. If you’re making a day trip at this time of year, you’ll get a chance to see the forests come alive in gold, red, and orange hues. In this area, the leaves change color around the end of October and usually last until early November. One of the best places to see autumn leaves is the Maple Corridor where 60 Japanese Momoji trees line a 2km walkway. 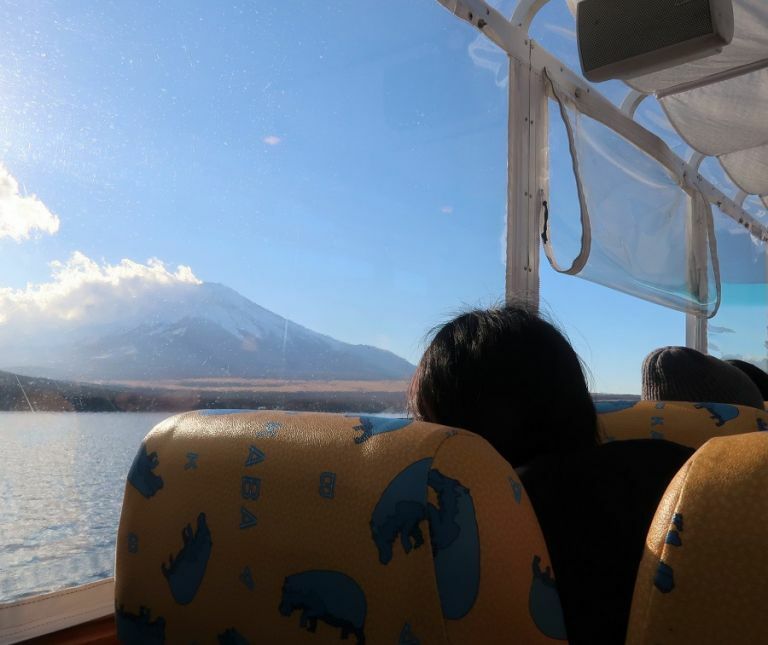 If you’re looking for a great day trip from Tokyo to Mt Fuji, click the link below to check out our tours!